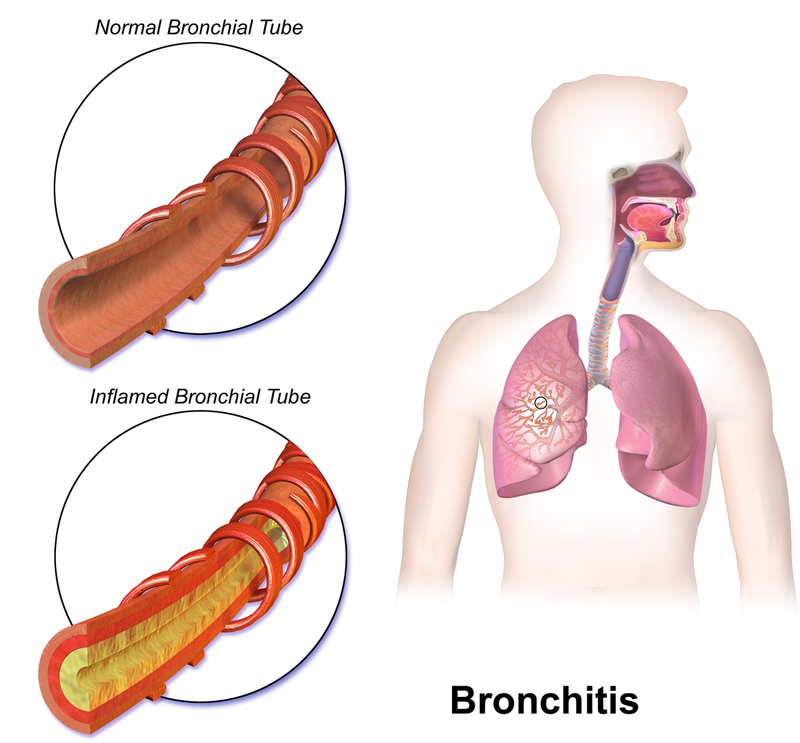 Bronchial asthma is one of the most common diseases of modern times. 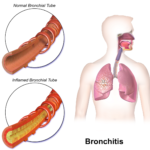 We characterize it as a disease affecting our airwaysfrom them especially bronchi. 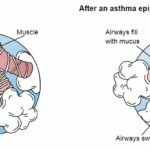 It’s a disease that modern medical science can not yet be cured, but with medication, doctors in majority managed to keep asthma symptoms in asthmatics to a minimum. Astmatikův life make it difficult asthma attacks (also also asthma attacks), which cause bronchoconstriction and bronchioles and thus to breathlessness. The reason for the difficulties in asthma is inflammation caused by faulty immune system response. Recently, we observed a significant increase in the number of people with this disease. It is reported that asthma suffers to this day every twelfth Bohemia. The sharp rise in this disease in recent years has been observed mainly in children. For the cause of asthma is always a number of different factors. 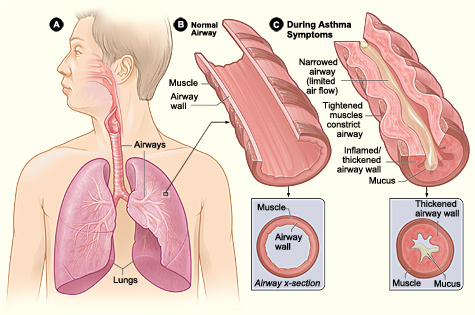 They are caused primarily asthma closely bonding allergy (almost every asthmatic is also an allergic) e.g. pollen, grass, mites, fungi, and other. Another risk factor may be contaminated environments. One should also avoid stress, long-term work in dusty environments and to protect your health as much as possible, as well as frequent respiratory infections are one of the reasons for the later development of asthma in humans. High group of asthmatics are the passionate smokers, since smoking now belongs to the most frequent reasons for developing this disease. A significant role also represents inheritance. If you have allergies or asthma someone in your family, the risk of outbreaks of the disease in you has significantly increased. The most common triggers asthma animal dander (especially cat and dog), feathers, mold, dust, but also food and strong irritant chemicals such as various distinctive perfumes, colors, varnishes or cigarette smoke and others. The trigger may also be allergens contained in medicines. Or rather early symptoms of asthma symptoms are sudden shortness of breath and cough. Dry, irritating cough asthma often worsens at night and disturbs his peaceful sleep. The first and most obvious sign of incipient asthma often constant cough, which may be accompanied and followed by dyspnea. Shortness of breath aggravated by know and effort, which will give us the effort to breathe again. Our breath is accompanied by characteristic hoarse or whistling sounds. These sounds are caused by swelling of the mucous membrane, which thus acquires the shape of whistles and air flow during exhalation elicits these sounds (whistling a similar principle to the whistle). The wheezing is associated also gasps and uncomfortable pressure that asthmatic feeling in the chest. Tightness in the chest causing asthmatic uncomfortable tightness in his chest or his grasp.This pressure is caused by lung asthmatic wheezing when faced with high resistance that must be controlled. The course and symptoms of asthma may vary among individual patients and also individual seizures may occur for one person differently. When severe bout of asthma can cause difficulties and such a common thing as speech. 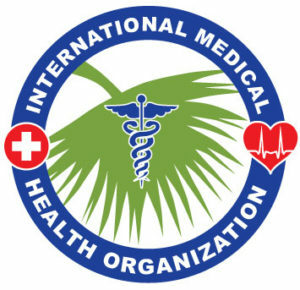 An acute attack of breathlessness may be accompanied by anxiety or even fear of choking up and unfortunately may, without timely medical assistance, be fatal. The first step in treating asthma is to visit a doctor who will discuss your problem, the circumstances of their occurrence and asks you whether in your family encountered similar difficulties and allergies. Investigations further progress by listening to the heart and lungs. Next you will be taken (in medical parlance ,, filmed “) spirometry, a test measuring various parameters of the function of your lungs. The test is performed so that constipation nose (to not run air), put into his mouth muzzled attached to a tube that is connected to the spirometer and breathe out and breathe in the instructions nurses. Spirometry measures the speed at which air flows during exhalation and inhalation, also determines tidal volume of your lungs and other data. Spirometry is then carried out at regular intervals (eg. Every 3 months), so that the doctor can reliably determine whether the treatment is working or not. The most important task of the physician in diagnosing the disease and its subsequent treatment is to find the underlying cause, or rather causes your asthma. There are two ways to detect these causes. One of them is a skin allergy tests, when you will give yourself an injection, the most common allergens. Usually, this test is carried out on the forearm. The doctor assesses the redness and swelling around the injection site. Allergies can be recognized if a given allergen reacts our body in an enlarged scale than in others. The second method is called. 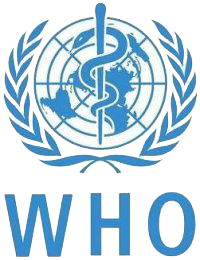 Provocation test, which consists either in the administration of the substance and monitoring the condition or deterioration in examination after exercise, i.e., the physician directs the patient např.uběhnout one kilometer and after finishing determines the extent to which they came difficulties. Asthma is a long haul. Asthma is an incurable disease whose symptoms are not in adherence substantially dampen or disappear completely. 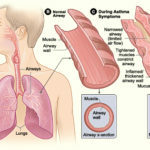 Asthma occurs throughout life. Depending on the nature and strength of our difficulties our doctor will determine the treatment and prescribe medication. Medicines used to treat asthma Although asthma can not be cured, but its symptoms significantly moderates and lead to control over their patient’s illness. 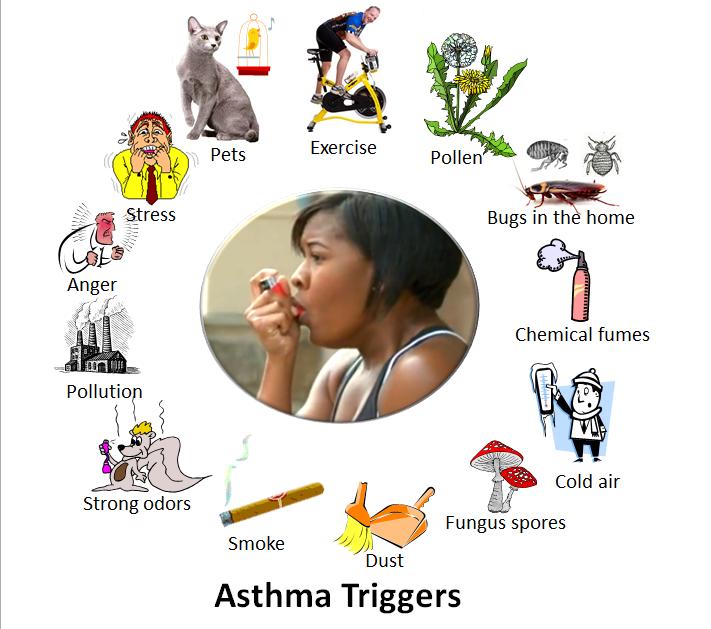 Asthma medications called antihistamines. Used drugs can be divided into two groups. These drugs reliever and anti-inflammatory medications. Drugs rescue exercises in asthmatic seizure, namely suppressing acute difficulties in the attack.They work quickly and are capable of preventing short-term symptoms of asthma. Inflammatory drugs contrary, have the opposite character does not act in the short term, but their purpose is long-term control and prevention of asthma symptoms. Such drugs are taken daily and although there are plenty of long-term asthma without symptoms of asthma does not, it should be taken continuously. Women with asthma in the event of pregnancy should discuss this situation with your allergist.Reaction pregnant women with this disease, they vary and do not determine in advance. About a third of women report improvement in asthma, a third of it has no effect, and a third of women pregnant with asthma symptoms worsen. Therefore the woman before the scheduled begetting offspring should consult their doctor and possibly a change in treatment. Maintaining asthma control is very important in order to ensure the proper course of pregnancy and subsequent birth. The goal of treatment is the patient gaining full control of their disease. Asthmatic should not experience any symptoms of his illness. His asthma by him in successful treatment should not be limited at all. Dyspnoea not to appear, and reliever medications should asthmatic thus did not need.His lung function should be almost normal. The basis for successful treatment is prevention. Along with proper treatment can significantly improve the quality of life of asthmatics. Basic precautions should be taken as early as the youngest childhood and even before birth. These actions may affect the development of the immune system of the child and thus prevent disease. Among the most important principles in pregnancy include not smoking during pregnancy and in the last 3 months, try to avoid contact with risk factors. After the birth of the child would not be primarily comes into contact with cigarette smoke and care should be taken that lived in a dust free environment and overall convenience. 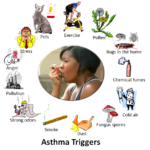 If you already have asthma found, it is important to focus primarily on influencing asthma triggers. For full foundation is considered to be an effort to eradicate or rather reduce the risk factors that cause asthmatic problems. So those factors which cause coughing and wheezing. It is also necessary to adhere to the principles of clean and safe home and try to avoid the impacts of various allergens. It should also comply with the so-called. Dust mode, which involves the removal of such things at home they catch dust. Among the so-called. Dust catchers include in particular the curtains, carpets and upholstered furniture. One of the most important measures should be absolute and strict ban on smoking in asthmatics home. Asthma, when it is under control, has little or no impact on daily life. But the rules of prevention is always important to respect and especially when the ambient conditions in any significant change (eg. On vacation during prolonged inversion etc.). The course of asthma and related problems can largely affect ourselves. If you are burdened with family predisposition to asthma or already have it, is in place, begin to try, if possible, to reduce the incidence of risk factors in our environment and avoid all triggers. Certainly, you should limit your contact with furry animals, especially those to which you are allergic. You should avoid especially cats, whose fur causes severe allergy. If you already have just such a beast in your home and want to keep it, so it is recommended not to let it at least into the room where you sleep. To do this, you often have to vacuum and clean, not to have an animal dander, allergens and thus all over the apartment and minimize the risk of pain. It is very important not to smoke! Asthmatics are also advised avoiding smoky spaces and stay longer in them. It is also better to limit the use of perfumes, incense and various air fresheners, especially those brilliant and insightful. Other measures include frequent and regular change of bed, because in them surviving mites.Bedding should preferably be replaced and washed once a week. Another necessary measure is, unfortunately for those of us who do not like to clean up, regular cleaning of the apartment and especially to concentrate on dusting. Dust should wipe with a damp cloth to prevent it from swirling and disperse into the air. Chemical cleaners should be non-irritating. An important factor is the well being and avoiding stress. Asthma is very important to properly cure any diseases, especially colds, flu and other diseases that affect the respiratory system, and therefore to avoid the risk of attack. The pollen season is also a good idea to avoid high grass and their picnics limit. Asthmatic should also not carry out painting or painting, prolonged contact with fresh paint and varnish fact may cause shortness of breath. During the year, there are also situations where you should also restrict ventilation, eg. During the pollen season or in a deteriorated state of the air (smog, stuffy before the storm, and others). Lots of people think that sport should not be run asthmatics. But the opposite is true, for some asthmatics winning the Olympics. Sports asthmatics as with others helps to improve airway function.Suitable sports include eg. Running, swimming or biking. They are also recommended stays at sea, which have beneficial effects on the body and lungs of asthmatics. The same effect can also stay in the mountains, which you can also enjoy with us. If you do not have time to go to the sea or the mountains, nothing prevents you go to the nearest sauna and salt cave, which also have healing effects. Another option is the new last years polarium that looks like a sauna, but unlike the sauna is heated up here. Conversely, the temperature here drops below -100ºC and treated with the frost.